Your refrigerator, your fruit bowl and your kitchen cupboards can be an unlikely source of topical nourishment for your hair. Whether you suffer with an itchy scalp or dandruff, fine or limp hair, dry or frizzy hair, oily hair, or dull, weak and lifeless locks, we have the hair mask recipe for you. This is a two-step, all-natural treatment that soothes the scalp and fights dandruff-causing bacteria. Plus it doesn’t contain any of the toxic chemicals found in traditional dandruff shampoos. 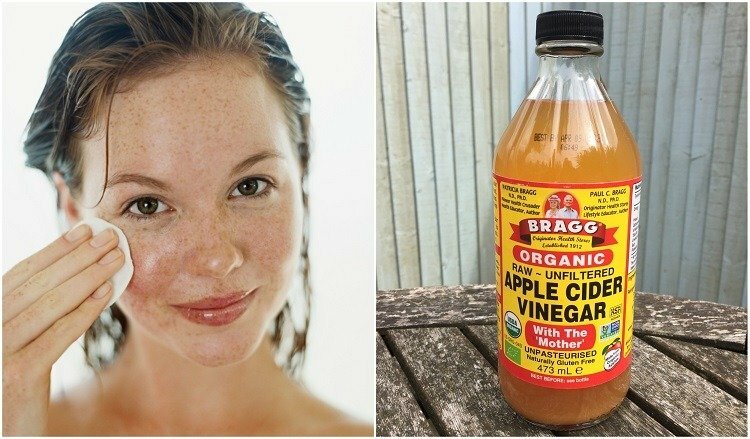 The cider vinegar rinse will need to sit in your hair for a bit, so grab a good book. Mix the flaxseed oil and sugar together in a small bowl, then massage it into your scalp. Let the oil sit in your hair for 20 minutes. To keep it from getting all over the place, put on a shower cap. While the mixture is soaking in, put the vinegar, hydrogen peroxide and water into a spray bottle and it all together. Hop in the shower and wash your hair using a small amount of shampoo (but no conditioner) and warm water. Wash out your shower cap while you’re at it. Rinse your hair completely and then towel dry it. Spritz your hair and scalp with the cider vinegar mix, separating the hair into sections and being sure to cover the whole scalp. Avoid getting the mixture into your eyes, as it will burn. Massage the mixture into your scalp well and put the shower cap back on. Let it sit in your hair for up to one hour, then rinse thoroughly. The first time I heard of volumizing hair with stale beer, I was skeptical to say the least. After I tried it, I was amazed. It turns out that the yeast from the beer adds volume to your hair it leaves proteins behind that repair damaged hair and helps healthy hair grow. I told a stylist friend of mine about the trick and she recommended the recipe below, applied every two weeks. Turns out the eggs add even more protein and removes oils that can weight down your hair. Mix all of the ingredients together and massage into clean, towel-dried hair. Let it sit for about 20 minutes and then rinse well with cool to lukewarm water – too hot and it will cook the egg. Bananas and avocados are both amazing for your health and your hair. They are packed with vitamins, essential fatty acids, and natural sugars that your hair can easily absorb. You only need to use it once a month, and your hair will be healthy, shiny, and frizz-free! Plus, it’s a great way to get rid of over-ripe bananas and avocados. Mash all the ingredients together and massage into clean, towel-dried hair. Put on a shower cap and let it soak into your hair for 15-30 minutes. Rinse your hair in cool water. Put a heavy paper towel (or some sort of filter) over the drain to catch all the chunky pieces. This is an old folk remedy that works well with oily hair. It is also reported to prevent hair loss. Just like the recipe for fine hair, eggs add protein to the hair, helping repair damaged strands and grow healthy new hair. The clay absorbs toxins and oil from the hair, plus it has great antibacterial properties and promotes a healthy scalp. You can buy clay for this mask at your local natural foods store or try Argila Natural Green Clay Power, available on Amazon. Mix the ingredients together and massage into dry hair. Put your hair up shower cap and let it sit for 30 minutes. Wash your hair with gentle shampoo and rinse with cool water. Styling products and environmental toxins can steal moisture from your hair and leave it looking dull, lifeless and easily breakable. The egg whites and lactic acid (from the yogurt) will remove the dirt and residue; the fats from the yogurt and mayo provides deep moisturizing. Try this treatment every couple of weeks, and your hair will come back to life like magic.